The £76 million civil nuclear Sharing in Growth programme aims to develop the UK manufacturing supply chain and help UK companies win work in nuclear programmes – including new build, operations and decommissioning – at home and overseas. The civil nuclear Sharing in Growth programme is part-funded by government through the Regional Growth Fund, and led by the Nuclear AMRC with support from Rolls-Royce and other industry leaders. UK manufacturers of mechanical equipment can now apply to join a four-year programme of business development and training as part of the civil nuclear Sharing in Growth. The support will be tailored to the needs of the participating companies, and will be worth around £1 million per project. Professor Keith Ridgway CBE, programme director at the Nuclear AMRC, says: “The nuclear sector provides huge opportunities for UK manufacturing companies, and the Nuclear AMRC is dedicated to helping them become suppliers of choice to the global nuclear industry. Business and energy minister Michael Fallon says: “Our nuclear industrial strategy set out how, working with industry, we would capitalise on the significant growth opportunities for the sector. This RGF-funded programme is a good example of how we can work together to sharpen our competitive advantages and grasp this unique opportunity to create jobs. 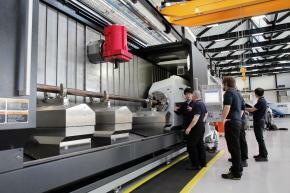 It builds on earlier support provided by Government for the Nuclear AMRC – a centre of manufacturing excellence. Support provided under the civil nuclear Sharing in Growth programme will include shopfloor manufacturing improvement, process improvement, leadership development and specific nuclear sector knowledge. Support will continue for four years, ensuring that it delivers sustainable benefits. To be considered for the first round, applications must be received by 10am, Monday 15 July.